If you’re just getting your feet wet with WordPress, you’re probably coming across plenty of conflicting information about the world’s most popular content management system, right? You’re seeing terms like WordPress.com, WordPress.org, and self-hosted WordPress thrown about. So what is this WordPress.com vs WordPress.org dichotomy? If there’s one question that perplexes most WordPress beginners, it’s this one. And understandably so…you have two different tools using an almost identical name. Trust me – you’re definitely not the only person who’s been ensnared by the WordPress.com vs WordPress.org dilemma. Know what the differences between WordPress.com and WordPress.org are. Understand which of these two tools you should use to create your own website. Let’s dig in and settle this once and for all! 4 Are WordPress.com and WordPress.org Owned by The Same Company? 5 WordPress.com vs WordPress.org: Which Should You Use? 5.1 How Much Does WordPress.com Cost? 5.2 How Much Does Self-Hosted WordPress Cost? Let’s start off with a high-level look at the basic difference between these two tools. WordPress.org is the home for the standalone WordPress content management system software. This is the software that you, or anyone else, can download and install on your own web hosting to run all kinds of sites. All for free. WordPress.com, on the other hand, is a “website as a service” site that runs on the WordPress.org software. While this is a bit of an oversimplification, you can basically think of WordPress.com as one specific implementation of the WordPress.org software. I’ll get into why this distinction matters a bit more in the following paragraphs. Beyond that connection, the two are not connected in any official way (though they are heavily intertwined because Automattic, the company behind WordPress.com) has a number of connections to The WordPress Foundation (the official owners of the WordPress trademark). As I mentioned, WordPress.com is a website as a service platform. What does website as a service mean? Basically, you can sign up and launch a website…all without ever having to look at a single line of code or deal with website hosting. WordPress.com takes care of everything. Then, WordPress.com provides you with a closed environment to choose your theme from a pre-defined selection. Because it’s a closed environment, you can’t install your own plugins or themes. Instead, WordPress.com has taken some of the most popular WordPress plugins and baked that functionality into WordPress.com sites. You don’t need any technical knowledge to get started. It’s pretty much impossible for you to “break” your site…because you don’t have the permissions required to do so. Basic maintenance (like updates) is handled for you. You can get started for free if you’re willing to use a WordPress.com subdomain. You get special dashboards and tools that aren’t always available to WordPress.org sites. Sounds great, right? Why would anyone choose WordPress.org if WordPress.com is so simple and easy to use? You can’t take advantage of WordPress’ massive third-party theme and plugin marketplaces. Your monetization options are severely limited. If you want to make money from your site, WordPress.com is a horrible choice. While you can always export your content, you still don’t entirely “own” your content because it’s all on WordPress.com’s hosting. WordPress.com could decide to just shut your site down one day and there’s nothing you could do about it. Are things starting to come together a bit more? Let’s take another step and dig into WordPress.org. WordPress.org, also known by the moniker “self-hosted WordPress,” doesn’t help you create a website by itself. 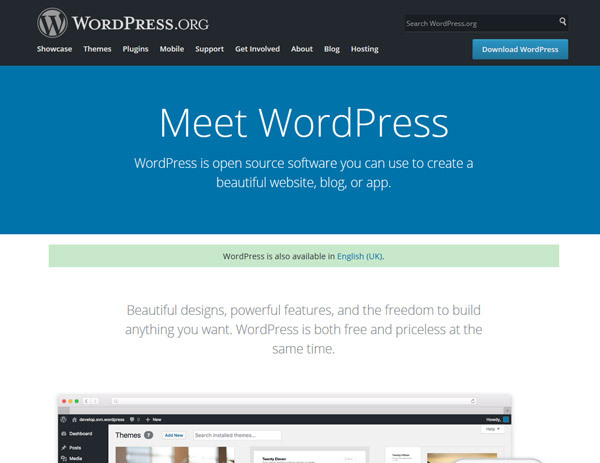 Instead, it gives you access to the open source WordPress software. To launch your own website, you need to host this software on your own web host. While it’s actually pretty simple to do this, you will need a tiny bit of technical knowledge to get this done. That is – it’s not quite as simple as WordPress.com – but most people should have no trouble figuring things out. Once you get the WordPress software installed on your web host, you’ll be dealing with a 100% open environment. That is, you can control every single aspect of your site. You can install any theme or plugin your heart desires. And if you feel up to it, you can even dig into your site’s code to change things up. You can take advantage of the tens of thousands of awesome plugins and themes available for WordPress. These allow you to add pretty much any functionality you can dream of to your site. You can monetize your site however you’d like. Because you’re in full control, there are zero limitations on what you can do. On that same line – you own everything about your site. You now need to be aware of breaking your site. While self-hosted WordPress is still pretty simple – the wrong plugin combination or code tweak can render your site unusable. Backups, updates, etc. are now 100% your responsibility. Even though hosting is cheap, you’ll still need to pay at least a little bit for your site (more on that in a second!). Are WordPress.com and WordPress.org Owned by The Same Company? Officially, no. WordPress.com is owned by Automattic and WordPress.org is a non-profit administered by The WordPress Foundation. See, Matt Mullenweg is both the CEO and founder of Automattic as well as the chairman of the WordPress Foundation. So while the two are separate organizations…the leadership is the same. As you can imagine, that leads to muddied waters and makes some people in the open source WordPress community upset. But that’s getting a bit beyond the point – the important thing is that these two platforms are, at least officially, separate entities. In the end, it comes down to this. If you’re serious about your site, WordPress.org, AKA self-hosted WordPress, is almost always the best choice. Its flexibility in terms of both monetization and functionality makes it the best option for serious sites…even if it does have a bit more of a learning curve than WordPress.com. You want to create a hobby blog that you don’t ever intend to monetize. For example, if you want to create a simple blog to share travel pictures with your friends and family, then WordPress.com is a great option. You really can’t afford self-hosted WordPress. If you have zero money to invest in your site, starting on WordPress.com is really your only option. Allow some WordPress.com ads on your site. To remove the ads, get your own domain name, and add some additional features, plans start at $2.99 per month and range up to $24.92 per month. How Much Does Self-Hosted WordPress Cost? Domain Name – typically ~$10 per year. Hosting – as little as ~$4 per month if you use a host like Bluehost. You can also find plenty of other WordPress hosts. 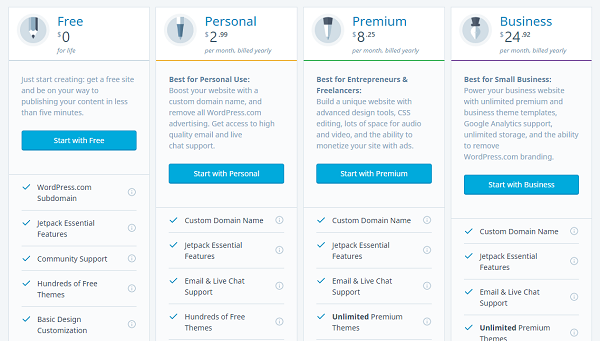 But you can also certainly spend more money if you want to purchase premium themes and plugins. While there are plenty of free themes and plugins, you typically need to crack open your wallet if you want the absolute best functionality. And that pretty much wraps up our comparison of WordPress.com and WordPress.org! 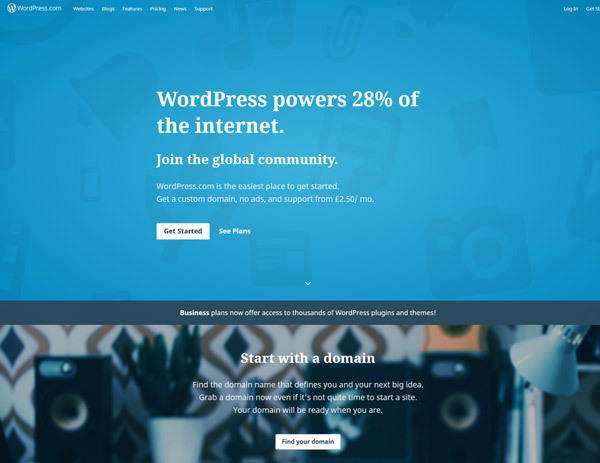 For the vast majority of uses, WordPress.org (self-hosted WordPress) is the right choice. While WordPress.com certainly has its place, you’re missing out on most of the benefits of WordPress when you limit yourself to WordPress.com. If you need help getting started with self-hosted WordPress, we have a detailed guide that shows you how to set up your own WordPress site in less than an hour. It’s pretty simple! If you can navigate your way around most websites, you can probably figure out self-hosted WordPress. Now get out there and launch your first WordPress site!